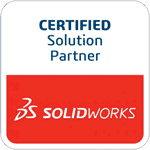 This quick tip will show you how you can quickly add a note box to any SolidWorks file. Here we have a part file for a hand grip. Let’s say you’re sending this file off to a colleague and want to add a note inside the part file. There are a couple ways you can do this. First, expand the Insert pull down menu. Now highlight Annotations and select Note. When you do the Note box is attached to your pointer and you can add it anywhere in the graphics window.